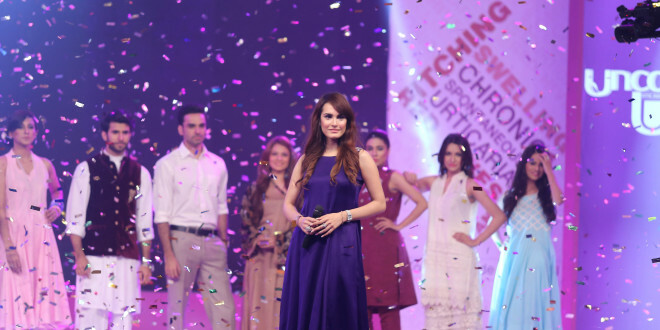 The group of prominent doctors and show biz personalities have organized an evening of science and art coming together to spread awareness about a debilitating skin condition known as Urticaria in collaboration with Novartis Pharma Pakistan recently. The presentation had the presence of people from different walks of life including showbiz galaxy, renowned dermatologists across the country, eminent celebrities, social organizations and media personnel. Secretary Information Sindh, Dr Zulfiqar Shalwani was the chief guest while Salma Kausar-Senior Medical Director of KMC, Country President Novartis Shahab Rizvi also graced the occasion. The event aspires to help improve patients’ quality of life via dispersing an understanding of Urticaria through live performances and expert discussion. The live performances, beautifully choreographed to highlight the effects Urticaria has on social and professional lives of the victims, entailed a piece by Joshinder Chabbria, a real doctor patient interaction, and a theatrical ramp show lead by famous Model & Socialist Nadia Hussain. Each segment elaborates various aspects of a typical Urticaria patient’s ordeal. Chronic Spontaneous Urticaria (CSU) is a severe form of skin allergy prevalent in Pakistan, which may affect anyone at any time. It was highlighted that the effects of CSU are more than skin deep. Alongside the distressing physical symptoms, CSU can be a great psychological, social& economic burden.CSU’s spontaneous nature may leave people living in isolation due to fear of unpredictable outbreaks.The highly interactive expert forum included discussions exploring the issues pertaining to Urticaria.Highly respectable dermatologists namely Dr. Shahid Abbas, Dr. Azer Rashid, Dr. Iqbal Tareen, Dr. Pervez Iqbal, Dr. Badar Dhannani , Dr. J I Bhatti, Dr. Afzal Lodhi, Dr.Hatim Ali Shah, Dr. Faisal Khilji, Dr.Sharf Ali Shah, Dr. Atif Kazmi, Dr. Saeed Haneef, Dr.Azeem Jahangeer , Dr. Haseeb Sajjad, Dr. Ijaz, Dr.Uzair Qureshi, Dr. Tariq Zaman, Dr. GM Cheema, Dr.Najia Ashraf,among others shared their valuable insights. The 1st ever patient group – The ‘U within Association’, also attended the event with innovative activities to promote public awareness about urticaria. The evening’s finale was a great song dedicated to the Urticaria patients by the very famous Music Icon Natasha Baig and Pakistan Idol runner-up Sajid Khan. An interactive Q&A session all about Urticaria was also arranged in which eminent dermatologists shared their insights. The evening’s finale was a great song dedicated to the Urticaria patients by Natasha Baig and Sajid Khan. The event was well-attended by the people from different walks of life including famous film and TV artists, renowned doctors, well known social and health workers besides social organizations and media personnel. Mr. Zulfiqar Shilwani – Information Secretary Sindh and Dr. Salma Kausar – Senior Medical Director KMC participated as the guests of honour on the occasion. Mr. Shahab Rizvi – Country President Novartis welcomed the guests to the show. Headquartered in Basel (Switzerland), Novartis has core businesses in pharmaceuticals, vaccines, consumer health, generics, eye care and animal health. The company employs nearly 115,000 people in over 140 countries worldwide to help save lives and improve the quality of life. The Group is present in Pakistan through Novartis Pakistan Limited.